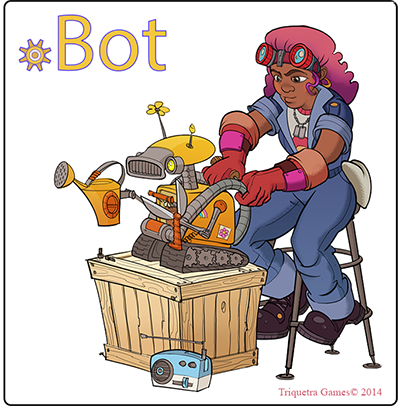 .BOT ("dot-bot") is a "fungineering" experience designed to for young women and families. Players collaborate and build robots in this strategic robot life simulation game in order to explore ancient civilizations, discover new technology, and build more fantastic robots. 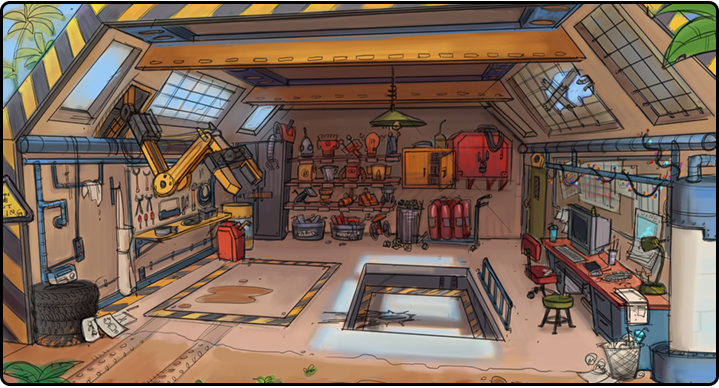 .BOT will be a creative, story-driven, engineering game aimed at inspiring people to pursue the technology careers of the future. .BOT will be initially developed for the PC to make content sharing a snap. We are inspired to make “games for good, games for everyone.” Bored by zombie shooters and mindless farming games, we were inspired to make games that do something more. We believe there is a market and a social need for games that both delight and inspire positive change. Expanding upon our prior success as game design contractors, we are poised to transition to developing unique games designed to make the world a better place. One of our greatest responsibilities today is preparing the next generation for the challenges of tomorrow. The jobs of the future will require innovation, collaboration, and most importantly, a passion for the STEM disciplines (science, technology, engineering, and math). Yet, women have been historically unrepresented within STEM careers. According the U.S. Department of Labor, only 22.5% of all programmers in the United States are women. Research has shown that young women begin to lose interest in STEM subjects beginning in late elementary and early middle school (ages 9 - 13). This lack of interest continues through high school and college. Without a passion for STEM, women are missing out on important opportunities of the future. We believe that games are key to overcoming this. It's been said that our children are the "gaming generation." While all games are educational, professional game designers need to focus on what they are choosing to teach. On the surface, players may be exploring ancient ruins or catching the winning pass in the Super Bowl. Underneath the experience, playing games encourages players to actively pursue and overcome challenges in creative and innovative ways. Game success is always tied to learning – players learn the winning combination of moves or learn where the magic key is hidden. Playing games require many skills from the STEM disciplines. For example, a player may want her hero to jump over obstacles. To implement this seemingly simple feature requires logic, physics, programming, and technical knowledge of the gaming device. Play can inspire values and engagement in STEM. We feel that a game is the right avenue for bringing young women into STEM. We are a mix of veteran game developers, university game educators, and recent graduates united by our passion for creating games for good. Our team has prior experience ranging from AAA titles (Star Wars and The Sims) to smaller educational games (bullying and science) on a variety of platforms (consoles, web, PCs, and mobile). We have been successfully engaged in game design contract work for over two years now. We know how to make games successfully and possess the ability to listen to our users and develop great experiences. We work to inspire the game designers of tomorrow. We mentor students from local colleges and universities. We actively recruit future talent from our community. We are also planning local game design jams with young women to inspire their interest in game design, technology, and STEM related careers. We give back to our community by donating 10% of our profits to local charities. In the future, we will empower our players to choose what charities their dollars support.